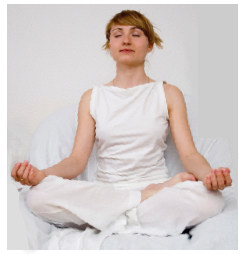 When you sit down to meditate, do you find yourself looking forward to an enjoyable respite of peace and relaxation? Or, do you feel that you are about to spend the next 15 minutes or so, working at a formidable task... uncertain that you can achieve a goal that's not altogether clear? If the latter seems more applicable to you, then you may be approaching meditation with too much "will," and not enough "grace." Too much will, in this case, means that you believe - and act as though - whatever happens in your meditation occurs only as a result of your own efforts... that you must make yourself relax, or quiet your mind, or eliminate your thoughts, or achieve a higher state of awareness. Yes, you may attain a bit of relaxation in this way, and perhaps even elevate your consciousness somewhat. You may even succeed in quieting your mind... for a few moments. However, there's an awful lot of work involved in all this. Relying solely on your will always involves a lot of effort. And the results are limited. Will, or self effort, can only take you so far in meditation. There is another way to approach meditation... a way that is not only easier and more enjoyable, but is also capable of taking you to the deepest, most satisfying states of consciousness. I'm speaking of opening to the energies of grace in your meditation. Grace can be defined as "a combination of cosmic energies coming together to elevate your consciousness." However, behind these impersonal cosmic energies, you will generally find wise, loving beings directing these energies... making certain you receive just the right dosage to fill your need for spiritual growth at that time. These are what author, Gary Zukav calls your "unseen teachers." They may be unseen, but they are always present to take advantage of any opportunity to assist you in your spiritual awakening. Grace is not just reserved for the "holy", and the concept of deserving does not really enter in. Grace is available to all, and there is an extraordinary amount of grace available to us now, during the current planetary consciousness shift... the remarkable spiritual awakening that humanity is now experiencing. Relying on grace in meditation does not mean that you use no effort at all in meditation. Ideally, meditation is a blend of will and grace. It's mostly a matter of finding the right balance. How is this done? Each meditation differs somewhat, but in general, it simply involves following the guidelines of a particular method with "relaxed effort", and then allowing for whatever happens, rather than attempting to make something happen. Not trying to make something happen includes: not attempting to quiet your mind or eliminate thoughts... not working to create an altered state of consciousness... not concentrating too rigidly... not trying to force the opening of your chakras - your spiritual energy centers. Just make a relaxed effort, and allow grace to do the rest. How can you receive more grace? Grace is, for the most part, a spontaneous happening. However, there are a few ways to elicit a bit more from the cosmos. Although you may not notice the difference every time, I've found that simply asking for grace at the start of each meditation is very often helpful. There's no need to beg or grovel. Just ask whomever you naturally tend to call on for assistance... Spirit, The Universe, your unseen teachers, etc. Being prepared to receive more grace basically means that your energy circuitry is strong enough and clear enough to conduct this powerful elevating energy. Strengthening your circuitry mostly comes from normal physical activity, such as walking, running, working, etc., and from practicing spiritual exercises, such as Yoga or Tai Chi. Clear energy circuitry is achieved through daily meditation, as well as via other healing and processing tools that are now available to us, such as certain types of massage therapy, hypnotherapy, creative visualization, Reiki, etc. If your meditation involves too much effort or control, it tends to dis-allow the spontaneous flow of grace. You can see this simple principle at work in the outer world as well. If you believe that you have to accomplish everything yourself, and never allow anyone to help, then of course, no one will. So it's helpful to be receptive, and to approach meditation with the attitude of it being a combined venture, rather than a solo effort. Once you become familiar with how this works, and find a comfortable balance between will and grace, meditation not only becomes easier, but also tends to become deeper and much more enjoyable.